The state Hygienic Laboratory in Ankeny today recognized the milestone of one million babies being tested since the neonatal testing program began in 1983. Iowa Department of Public Health Director, Tom Newton, says a sample is taken from the baby’s foot shortly after birth, and that sample is screened for some 40 potential diseases. He says while diagnosing the diseases does not indicate a cure, it does allow doctors and parents to begin treating diseases to lesson or avoid chronic infections and pain, mental retardation, physical disabilities, and death. 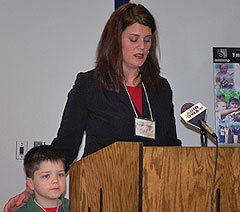 Blythe Stanfel of Des Moines talked about how the testing caught a problem with her sons. She says her four-year-old son Joshua and two-year-old brother Jonathan are now normal kids who chase each other around the house, and were saved from becoming mentally retarded because the test diagnosed they had phenylketonuria, commonly known as PKU. Stanfel says the disease would have gone undetected without the state test. Stanfel says PKU is a rare genetic metabolic disease that results in mental retardation and other neurological problems when not treated in the first few weeks of life. The disorder prevents a person from metabolizing part of protein in food called phenylalanine, and a build up of phenylalanine in the system eventually becomes toxic. Stanfel says she has to watch what her sons eat, otherwise, they are normal kids. Stanfel say the diet eliminates all the very high protein foods, such as meat, fish, poultry, nuts and many products containing flower. Patients are given a formula that provides the protein they need to develop. Newton says the tests are done only for diseases for which they know a cure is possible. He says the screening will continue to develop. He says there will continue to be disorders added as they develop tests to identify the diseases and their treatments. Iowa is the only state to offer around-the-clock testing. The lab also conducts tests for the state of North Dakota, and just recently finished conducting tests it had done for the State of Louisiana in the aftermath of the hurricane there. 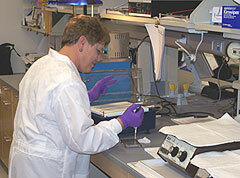 The blood of some 40-thousand Iowa babies is tested annually at the lab.